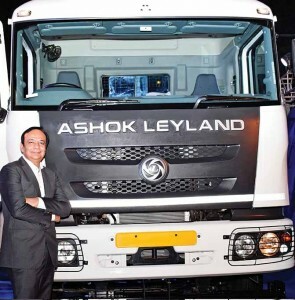 Ashok Leyland has launched Captain Haulage and 3718 Plus heavy-duty trucks in BSIV guise. Boasting of iEGR (Intelligent Exhaust Gas Recirculation), the installation is a part of the 180 hp, 5759 cc, six-cylinder, common-rail turbo-diesel engine that powers the trucks, the Captain Haulage and 3718 Plus are fitted with maintenance free hubs. The hubs include unitised wheel bearings that require no end play adjustment or bearing replacement. Available as an optional feature on 37T and 31T range, the unitised wheel bearings will over time be made available on all Ashok Leyland vehicles. Designed to deliver high uptime and faster turnaround time to meet the high productivity demands of the logistics industry, the Captain Haulage is claimed to offer the best-in-class cabin and frontal crash protection. It is aimed at applications like market load, parcel, tankers, cement bulkers and containers. The 3718 Plus, with a 37-tonne GVW, offers superior payload capacity (225 kgs more), up to 10 per cent better fuel efficiency and 10 per cent extra tyre life. Also equipped with a lift axle, the truck has an 8382 mm and 8991.6mm loading span options.